There are a lot of things in life we plan for: college, weddings, careers, kids and even what we’re having for breakfast tomorrow (an everything bagel with cream cheese for me). Yet there’s one major life event that a large number of us fail to prepare for: retirement. According to our recent survey, 25% of Wealthy Retirement readers don’t have a retirement saving strategy… and that’s scary. Why are so many Americans NOT planning for their golden years? There are a number of reasons why many of us aren’t investing for retirement, from lack of knowledge to fear of the market, particularly following the Great Recession. And quite frankly, some people find the topic so depressing when they look at their savings – or lack thereof – that they’d rather just ignore the issue. But one of the biggest factors that turns people off from retirement planning is the fact that, at first glance, it’s incredibly intimidating. You don’t know how much you should be saving or how much you’ll need, let alone where to even begin. But you don’t need all the answers to get started. All you have to do is, well, start – and the earlier, the better. 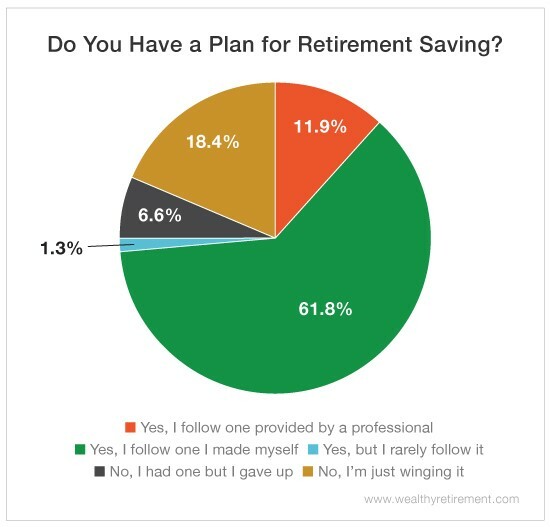 That’s the beauty of retirement planning: There’s no perfect path or “right” way to save. It’s different for everyone and depends on their lifestyle and goals. The important part is that you have some sort of action plan, whether it’s putting aside 10% of your paycheck each month or setting up a direct deposit to your retirement account. Plus, it’s always smart – and sometimes necessary if you want to be financially prepared – to invest in a 401(k), IRA or pension plan. There are also plenty of resources that can help guide you to your dream retirement – like this step-by-step guide to increasing your income. It contains secrets and strategies from 36 financial masters to help you grow your nest egg and retire the way you want to. Get all of the details here.